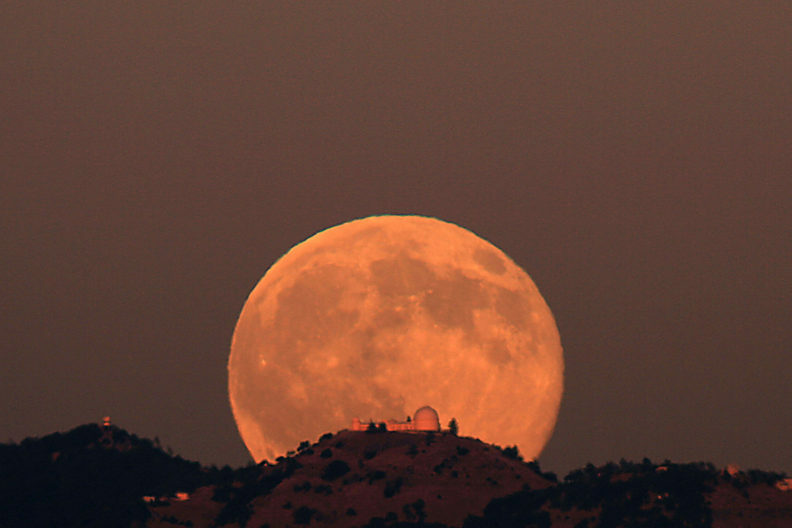 Strawberry moon rises above Lick Observatory in California, June 20, 2016. Photo by Rick Baldridge, NASA. PULLMAN, Wash. – A sweet celestial treat known as a strawberry moon will greet sky watchers across the Pacific Northwest Wednesday night, weather permitting. It won’t appear red with speckles of black seeds, but the first full moon of summer will take on a reddish tint and appear unnaturally large. What’s more, you won’t need to stay up late to see it, said astronomer Michael Allen of Washington State University’s department of physics and astronomy. Moonrise will occur at 8:24 p.m. Pacific Standard Time and be at its fullest by 9:53 p.m., he said. “When low on the horizon, the moon appears redder than what we can typically see, which will be the case Wednesday night,” he explained. And in a grand-scale optical illusion, the full moon will look bigger than usual, just as it begins to rise to the east, he added. Ideally, the low-hanging moon will resemble a rosy beach ball and be most eye-catching as moonlight shines around foreground objects such as hills, buildings and trees. This striking phenomenon, known as the “moon illusion,” has enthralled and mystified onlookers for thousands of years. “It’s a trick in our minds that makes the moon seem bigger than it really is. A low moon is no larger than a high moon,” said Allen. Sharing the spotlight Wednesday will be the planet Saturn. Appearing as a bright starlike object just to the south of the full moon, it will be at its biggest and brightest of 2018. Should you miss Wednesday’s night-sky show, a nearly full moon may cast a strawberry hue once again Thursday night, with Saturn shimmering nearby.